I noticed on one of your other sites that this plan is available in larger sizes. I’m just wondering what those sizes are, and if it the loft could be made big enough to divide into two separate and comfortable sleeping areas. Thanks! You could scale it a little, but not much. And certainly not enough to create 2 rooms in the loft. Instead of thatch you could use wood shakes, shingles cut from recycled metal, etc. Just joshing in my last post there. But it seems a lot of smaller designs lack a bath or shower. 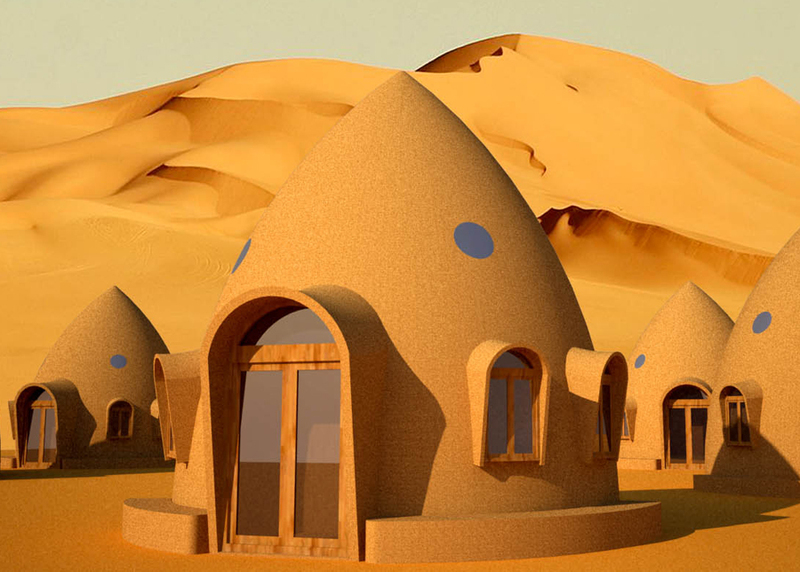 Would you do a custom one for the odd shapes of domes? There is a shower in the bathroom. It’s probably not apparent, but this is how people in Asia shower in tiny spaces. They use a wall mounted on-demand water heater. The floor is lower than the main floor and slopes to a drain. Regarding using an insulating material for an earthbag home in Maine – I wonder if one of the insulators you mentioned could be mixed with earth ? Like 50% rice hull, 40% earth, 10% cement – or something like that ? Hey it’s Craig from Maine again. We’ll I’ve been determined to build one of your genius designs. My pal has land in New Mexico (Rio Rancho) and I’m going to buy some. So here I am back browsing your designs. I like this one, I have an idea like a “dome train”, we build one with a big door on the side, then later remove that door and build another, it connects where that door was, and later another, and so on … Like a train ! Do you like that idea ? I can add to the train as time and money become available. You’ll want to detail the door so it’s easy to add on to. The area around the door will be a small vault with the outer edge vertical. Add other doors, of course. The design already takes this into consideration. The best places for new doors are at the base of the ladder and the window next to the wood stove. You’d have to redo the layout if you want to build the domes in a straight line. Actually, I would prefer to build them in an arc to create a protected courtyard. Yes indeed 🙂 I bet the land lot will be a rectangle, so an arc shaped “train” is a good idea. You don’t necessarily need me to draw a custom plan. You could buy the stock plan and just put them together. That looks very buildable and very livable. Which version would you recommend for northeastern Nevada (8-9″ rain per year, high elevation, c-c-cold winters)? 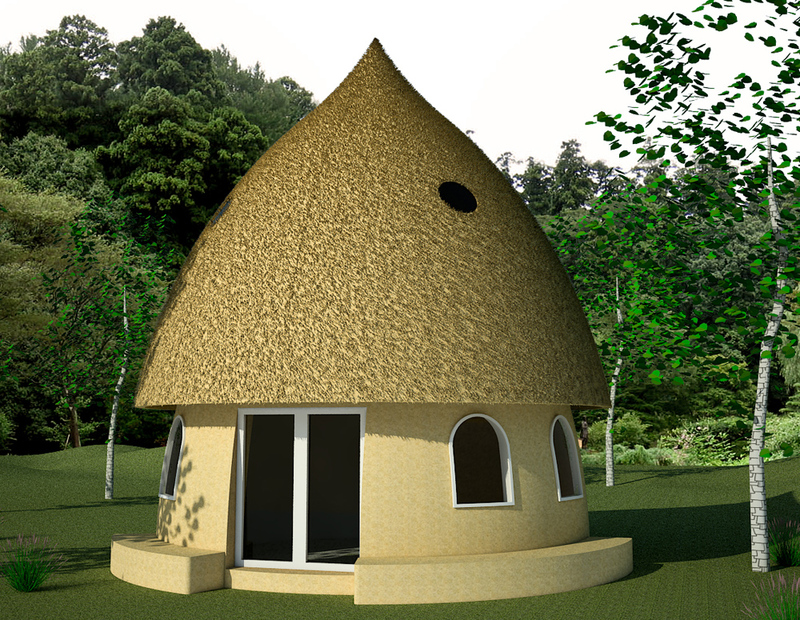 Our Natural Building Blog and Earthbag Building.com both have lots of free info about building with bags of scoria. Thank you. 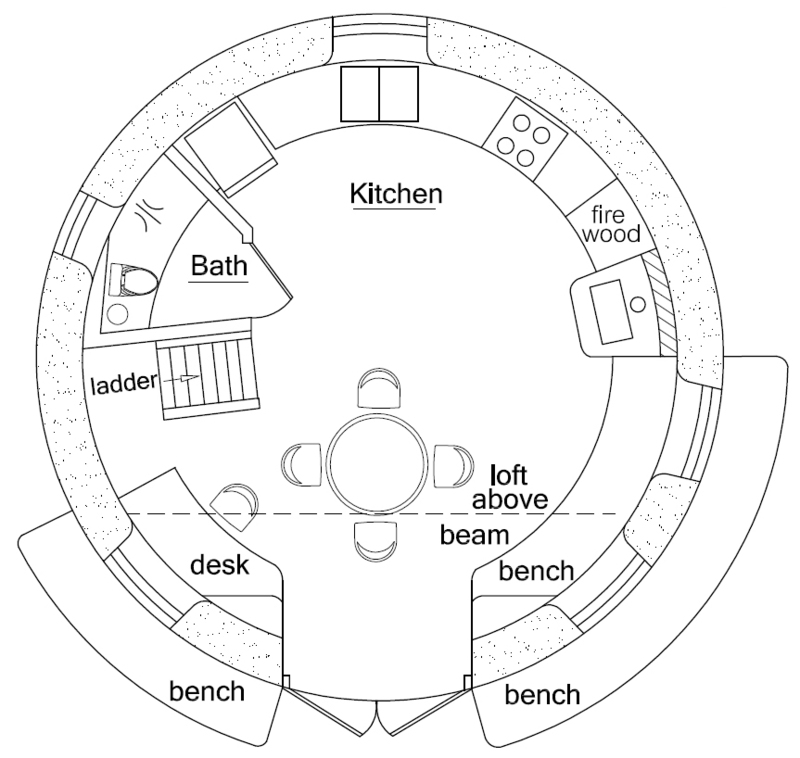 One more question and I’ll leave you alone until I’m ready to buy plans: does the loft play any structural role, or could it safely be omitted by a single householder (substituting a daybed for the bench)? The loft adds a great deal of strength similar to a bond beam by tying everything together. It also creates a platform to stand on to finish the upper walls. The loft is open in the front (see dashed line) to improve ventilation and create a sense of more spaciousness.